Earlier in January, a discussion thread started on Chowhound about what appliance could you not do without. I've waited until now to answer this question because I wanted to pay attention to what I relied on consistently. The appliance I couldn't live without is my Capresso Infinity Burr Grinder . 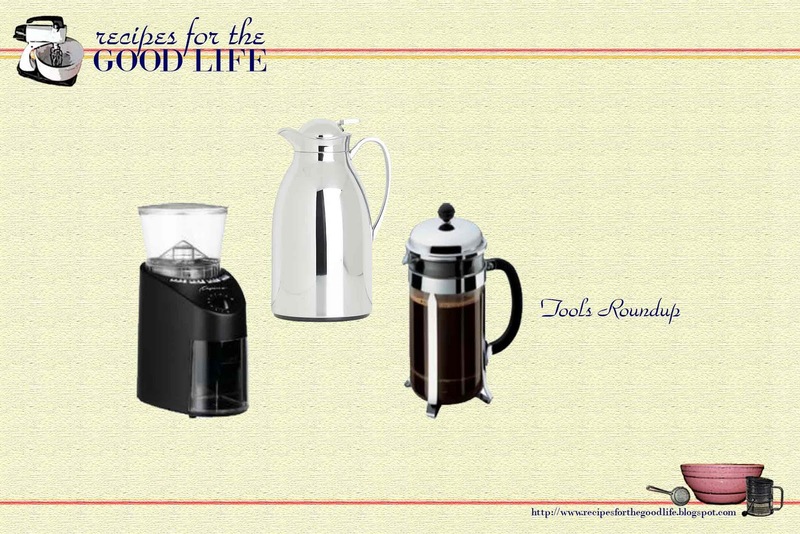 I tried out three different styles of grinders before deciding that only a burr grinder honors the labor that goes into the growing and harvesting of the coffee beans. I've had my Capresso since 2005 and use it almost every day. 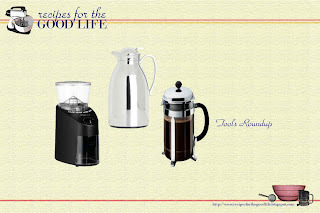 Capresso 560.01 Infinity Burr Grinder, Black via Amazon, $83.69 ; Mirror Carafe from Crate and Barrel, $34.95; Bodum Chambord Coffee Press via Amazon, $39.95 . The other two conveniences I couldn't live without are my Bodum French Press and our carafe. I've had the french press as long as I've had the grinder. Our carafe is a new addition to our kitchen. It was a wedding gift. I never fully appreciated a second cup of steaming hot, perfectly steeped coffee before this carafe arrived. Now as soon as the coffee is steeped it's transferred immediately into the carafe. When cubes wakes up two hours later he's also able to treat himself to a steaming hot cup of joe. You might have noticed that this week's posts were a little sporadic and off schedule. I was offsite attending the Emerging Media Conference over at the Hotel Kabuki. A local venue meant I wasn't traveling by train - my time for inspiration and writing. We'll be back on track (pun intended) next week. There was also a common theme with Thursday's Tips post and Friday's Where to Shop post - Thai cooking. (I've also been updating last February's What's in Thai Cooking post.) We're not going to be all Thai all the time, I promise. Let me explain. I've been getting ready for a Thai cooking class I'm going to be hosting on Sunday. I'm super excited to have the girls over, and I want the day to be both fun and valuable to them. We're going to visit a couple of the local shops for fresh ingredients and then we're going to hit the kitchen to make lunch. So while enjoying my morning coffee this week, I'd been organizing my thoughts into easily digestible topics and sharing with you. I've been gathering these topics into a cookbook that I'll hand out. I'll post the PDF of the cookbook from our day later next week in case anyone's interested. Thank you for continuing to read along and being patient with the change of schedule and topic.